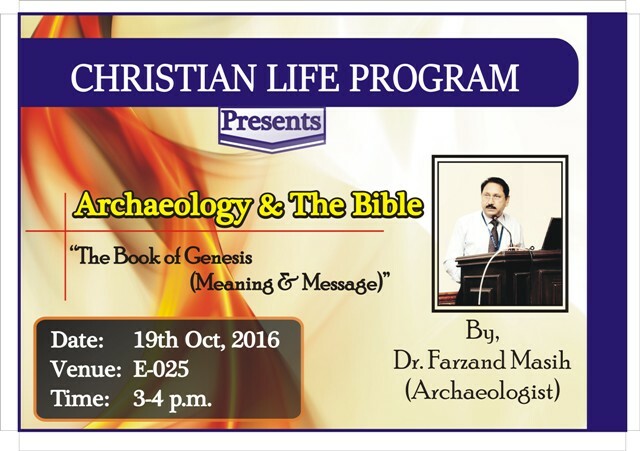 The Christian Life Program is organizing a Seminar on the Book of Genesis: Meaning and Message by Dr Farzand Masih. 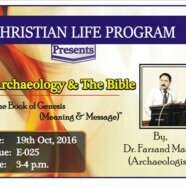 Dr Farzand Masih has been the Founder and Head of Department of Archaeology at Punjab University. He has been a part of many excavations, has been the Curator of Museums including the Harappa Museum and the Old Fort, Lahore. He has also delivered lectures at many foreign universities including Pennsylvania and New York State Universities. Refreshments will be served at the end for the attendees.